Find the true path by working your way into the maze from both ends. Block false path entrances by working your way backwards from dead ends. Never guess! Paint the path only if you are sure it belongs to the true path. 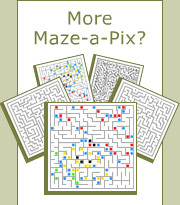 First solve the maze with a thin line and then paint the path with a solid color. In color puzzles, paint the path with colors after the true path has been found. Use the Click-ahead feature – it saves a lot of time. Click anywhere between the tip of the path and the next junction and the path will be painted intantly. Create gray trails to mark dead ends or junctions which you don’t want to enter. Path segments can be deleted by double clicking mouse anywhere along the path.